Tennis is a high-stakes game, played by prodigies identified early and coached by professionals in hopes of high rankings and endorsements. This commercial world is far removed from the origins of the sport. Before 1968—when Wimbledon invited professional players to compete for the first time—tennis was part of a sportsmanship tradition that emphasized character over money. It produced well-rounded gentlemen who expressed a code of honor, not commerce. In this authoritative and affectionate history of men's tennis, distinguished sociologist E. Digby Baltzell recovers the glory of the age. From its aristocratic origins in the late ninteenth century, to the Tilden years, and through a succession of newcomers, the amateur era and its virtues survived a century of democratization and conflict. 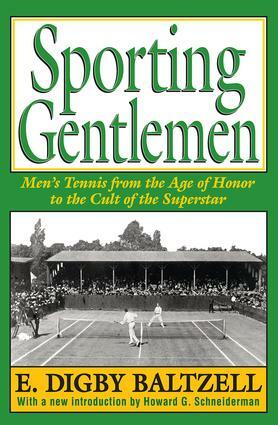 Sporting Gentlemen examines the greatest players and matches in the history of tennis. Baltzell explores the tennis code of honor and its roots in the cricket code of the late-nineteenth-century Anglo-American upper class. This code of honor remained in spite of the later democratization of tennis. Thus, the court manners of the Renshaw twins and Doherty brothers at the Old Wimbledon were upheld to the letter by Don Budge and Jack Kramer as well as Rod Laver, John Newcombe, and Arthur Ashe. Baltzell's final chapter on the Open Era is a blistering attack on the decline of honor and the obliteration of class distinctions, leaving only those based on money. For all who love the game of tennis, Sporting Gentlemen is both fascinating history and a badly needed analysis of what has made the sport great.